Group psychotherapy involves at least one psychotherapist and there is often a co-leader. Group members can be clients who are looking to benefit from learning Cognitive Behavioral Therapy (CBT) coping tools, or becoming more fluent in the skills they have already acquired. Concrete goals are established by each client, therefore almost anything can be addressed. Behavioral issues like procrastination, overeating, disorganization, not going to the gym, substance misuse, communication, relationship and workplace problems can all be targeted with the help of the group setting. In addition CBT is used to help clients learn to reduce the impact of negative emotions like anxiety, anger, guilt, shame, depression, stress, and embarrassment. While group therapy is often thought from a traditional psychodynamic perspective, CBT Group Therapy is different. CBT Group Therapy involves the leader teaching and reinforcing the use of CBT. Therapy sessions are structured with each client checking in on progress they made in the previous week and difficulties with which he or she may need help. Active coping on the part of the client is bolstered by group support and constructive feedback by group members and the group therapist. Each group member will also set weekly targets and the group leader will check on the progress weekly, without judgment. One of the most important aspects of the group therapy setting is a non-judgmental perspective. Progress will be evaluated, but group members learn to judge progress without judging themselves or each other. By reducing guilt, embarrassment, and shame clients can be more productive at getting back to working on goals instead of being plagued by negative emotions. Who could benefit from Group Therapy? 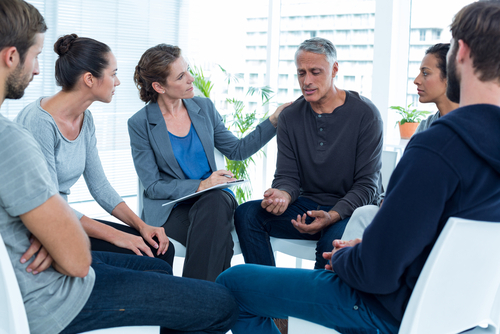 CBT Group Therapy can benefit those who are new to Cognitive Behavioral Therapy. Joining a group where you can hear how those more experienced have applied CBT successfully to their challenges is a great way to learn and can be very motivating. Likewise a group is also appropriate for someone who needs an extra night of support in addition to individual therapy. It is also an effective therapy format for those who need a safe place to improve their interpersonal skills. Those with social anxiety can practice the skills they need in the real world in a safe environment where they can get immediate feedback and encouragement. Likewise those with anger management issues often benefit from being able to role play. They can then hear both sides of the anger exchange, allowing them to more effectively communicate in the real world after understanding how their statements are interpreted by others. Group therapy still allows each member to present his or her week’s achievements, set backs, and develop a concrete plan to target improvements in the way individual psychotherapy does. But individual psychotherapy allots more time to this, since in the group, time is shared. Each member also benefits in other ways when others are presenting. It is often much easier to gain perspective when others are presenting an issue similar to yours, because you are able to get some distance. It is also normalizing to recognize that others may be struggling with similar emotional, relationship problems, frustrations, or worries. Many group members also report that often times they benefit the most from applying their CBT tools to others and offering advice. This makes sense, as many know one of the best ways to learn is to teach. In doing so, it also enables group members to be outwardly focused instead of dwelling and ruminating about their own problems. The group really facilitates adopting a wider perspective and a more compassionate approach to the self, instead of self-hatred and judgment. How can I begin Group Therapy? The first step to begin group therapy would be to call the office for an intake appointment. This is a one on one meeting with a therapist, usually the group leader. It is a 45-minute appointment where the therapist gets a sense of your strengths, weaknesses, and the kinds of goals that might be most important. The most appropriate group for you would be identified or individual therapy could be recommended if it would be better to start with that. Any questions you may have about group therapy, individual therapy, CBT, anxiety, anger, substance misuse, depression, etc. can be answered. The intake appointments are billed as an individual session.